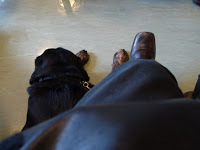 Grace and I are in the eye clinic waiting room. Here is a picture of my knees. Its already been an hour which is nothing. Time is not paid enough on the NHS to bother to do its job properly. It crawls and meanders, idles by the water cooler, plays endless games on its mobile. The bearded man opposite me is trying to distract his hyper-active six year old. She is wriggling on her seat, threatening to escape and run off down the dull grey corridor. ‘Hey Leah,’ her father cajoles. ‘We can do some drawing.’ He is reaching into his briefcase for paper and biros. But its crap, daddy!’ shrieks the little munchkin pushing her heavy glasses further up her button nose. ‘Crap! Amazingly I am only in this purgatory for two hours before being shuffled into a small room where I am met by a gruesomely efficient young woman with a bindi on her forehead. My pupils are dilated though, my sight distorted and fuzzy so it might have been one hell of a zit. Next year, I am thinking, are you crazy? I need to know what is going on now…why is my colour vision leaching so fast? Can you give me any good news? A more detailed prognosis…? What of current treatments..? I make some kind of gabbling sound choked with all the questions and anxieties I have been storing up over the last twelve months but its too late and this woman just doesn’t give a ..scrap. I am given the bum’s rush. We sit and watch the birds on her bird table outside the window. 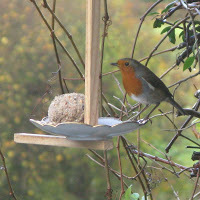 There is a robin; brown, blood- red and white and puffed up like a little ophthalmology consultant. I can see him though not clearly and I describe him to C. She sighs and nods wondering about her future. I try not to think about mine. Oh T, how completely ghastly for you and your friend. It's an absolute disgrace that people should be treated so badly. So many of these NHS workers seem to have forgotten they're actually dealing with real, precious human beings with feelings. Scrap, scrap, scrap! The beauty of your writing makes the harshness of it all the more poignant. Wish there was something I could say to help. What a situation. The state of the Health Service (yours and mine) is a disgrace. We lived in the North for a few years so were under the NHS. 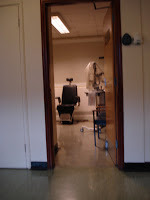 While there I had an eye test from an optician, who was worried because I tested with no peripheral vision at all in my right eye: he referred me to a specialist. True story. By 'next year', I'd emigrated. YUP, it's SCRAP all right. But I hope things look up for you very soon! I laughed out loud at the scrap story – but your experience is no laughing matter. I'm so sorry! Of course I don't have problems like that because I have a job with health care here in the U.S. (unless I go to the emergency room – then my experience would be EXACTLY like yours). But what if I didn't have a job? Or if my poorly paying job didn't have health coverage? It's just such a conundrum. Sometimes it's hard getting information about yourself. And even harder when they get so much practice at rushing people through and we get so little practice being assertive with people who are so good at rushing people through. That came out weird but you know what I mean. Sweetheart. Such rudeness, unprofessionalism and downright lack of humanity has be bristling in defence! Is it worth complaining, demanding to see someone else and get some answers? Sadly, sometimes it is only the noisy peoeple who get paid attention to…. Why don't you write a guest column OR a letter to the editor of your newspaper? Would that help? I hope Obama's national health care does not end up like Britain's. Here in Hawaii, I get excellent health care! Susan- that is dreadful! Imagine if it HAD been a blood clot or detached retina..argh!! What happened with your vision?All alright now? Hey Bug, yep… conundrum indeed. My cousin in US is being threatened with removal of health insurance and she has two small kids! Bit nerve wracking. Glad you are covered for the mo! Yes Katherine – now exactly what you mean! You NEED effieceint people to make things run smoothly but…. tricky. And yep Mud, Gigi… will probably complain at some point but will try and make sure it is constructive and with humour…so will give it a couple of days! Thanks for all your lovely comments! !